Before you create a pipeline in CodePipeline, add the Node.js test app to AWS OpsWorks Stacks. 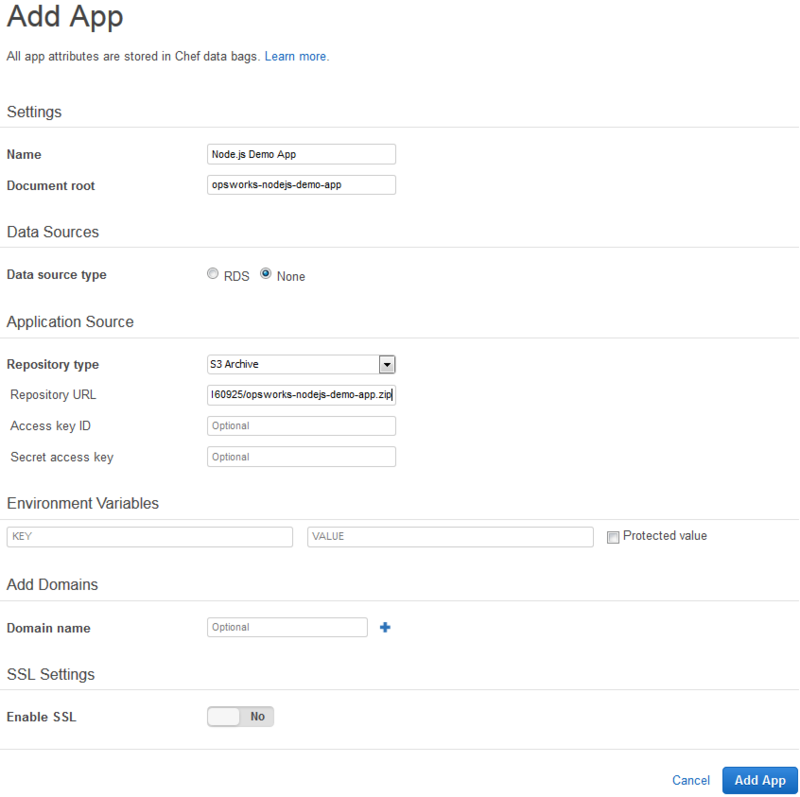 When you create the pipeline, you will need to select the app that you've added to AWS OpsWorks Stacks. Have the Amazon S3 bucket link from step 9 of the preceding procedure ready. You will need the link to the bucket in which you stored your test app to complete this procedure. In the AWS OpsWorks Stacks console, open CodePipelineDemo, and in the navigation pane, choose Apps. Specify a name for your app. This walkthrough uses the name Node.js Demo App. For Data source type, choose None. This app does not require an external database or data source. In the Repository type drop-down list, choose S3 Archive. You do not need to change any other settings in this form. Choose Add App. When the Node.js Demo App app appears in the list on the Apps page, continue to the next procedure, Step 5: Create a pipeline in CodePipeline.